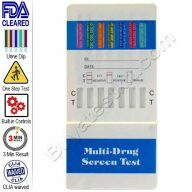 11-panel drug test kits manufactured for the detection of eleven drugs per test. They detect eleven drugs simultaneously. | Very simple to use. | Rapid results. | 99% accurate. | Low cost. | Long shelf life.